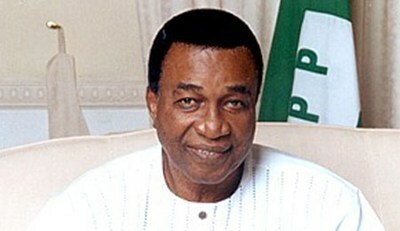 The South-East All Progressives Congress, APC, yesterday, described ex-governor of old Anambra State, Jim Nwobodo’s entry into the party as a grand plan to shield himself from the long arm of the law, following his alleged involvement in the $2.1 billion arms deals undergoing probe by the Economic Financial Crime Commission, EFCC. The ex-governor was reportedly mentioned as one of the beneficiaries of the arms deal to the tune of N600 million meant for the Peoples Democratic Party, PDP, campaigns and mobilization in the South-East geopolitical zone in the days leading to last general election. But reacting to the defection in a statement, APC South-East Caucus spokesperson, Osita Okechukwu said, Nwobodo entered APC through the window as a fugitive running from justice.